The New Canaan Building Department on Tuesday received an after-the-fact application from the owner of 1541 Oenoke Ridge Road who had completed an estimated $150,000 kitchen remodel without obtaining a permit. The work included installation of new cabinets, countertops and appliances, moving a sink, running a propane line and reconfiguring lighting. New Canaan Police at 11:26 p.m. Monday cited a 20-year-old Norwalk man for possession of less than .5 ounces of marijuana after stopping him on East Avenue for driving with a defective brake light. New Canaan will form a local committee to help with the 2020 Census, which will be conducted next spring, First Selectman Kevin Moynihan said during a kickoff event Monday at New Canaan Library. Outside of those scheduled to speak, members of the media, public officials and their aides, about five people attended. Speakers included Lt. Gov. Susan Bysiewicz, library board Vice President Christine Seaver, Selectman Kit Devereaux, state Sen. Will Haskell (D-26th), state Rep. Lucy Dathan (D-142nd) and Mark Plumley of the U.S. Census office. Saying Connecticut gets $11 billion from the federal government, the speakers urged residents to participate in the Census, and assured them that data gathered was not identifying on an individual basis. The Veggie Barn on Cross Street scored 94 points out of a possible 100 in passing its health inspection on April 3. Among the minor violations cited by a sanitarian during the unannounced inspection was “bare hands used to handle lettuce.” Dante’s Pizza and Miyuki at Pine Street Concessions also aced their inspection, scoring 96 out of 100 on March 25. 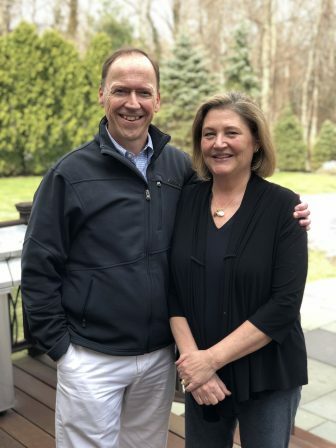 Walter Stewart’s Market is returning to sponsor the green color station at the NC Color Run, a fundraiser for the New Canaan High School Scholarship Foundation to be held April 27. The town on April 5 received an after-the-fact application for an estimated $10,000 in work that had been done at 40 Lakeview Ave. The owner converted a one-car garage into a bedroom, a job that included an interior remodel, removing a garage door, installing an egress window, building a closet and installing electrical and heat (no plumbing or bathrooms were added). New Canaan’s Rob Mallozzi, senior vice president and director of business development and government affairs at Bankwell, has been named to the Western Connecticut Economic Development District Board of Directors. 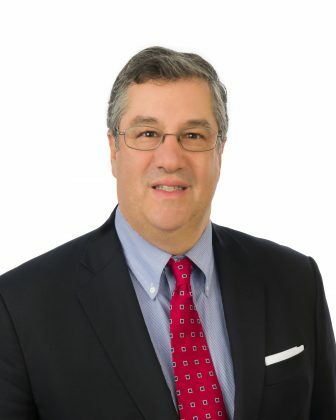 The group of public and private sector stakeholders guides the implementation of the region’s “Comprehensive Economic Development Strategy.” With Mallozzi, the town’s former first selectman, Bankwell becomes the only chartered banking institution in Connecticut represented on the Board, officials said. Moynihan said during a media briefing held Thursday in his office at Town Hall that he expects to have an announcement soon regarding the future of the New Canaan Police Department. More than half of South School students participated in its recent “Read-a-Thon,” which raises money for upcoming grade level field trips and assemblies. 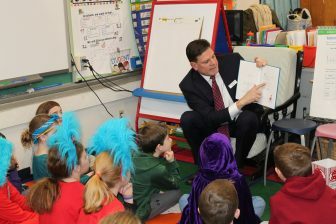 It featured Tish Rabe, who has been writing the Dr. Seuss “Cat in the Hat” series for 20 years, as well as guest readers from local organizations including the New Canaan Board of Education and Central Office and the New Canaan Police and Fire Departments. Other events included a visit to Waveny Care Center where students read to the residents. Note that members of the New Canaan Police Department are supporting the Special Olympics Connecticut and will have a booth set up at Caffeine & Carburetors on Pine Street to support the annual event. Those who wish to donate online may do so here. Moynihan also said during the press briefing this week that he expects Vine Cottage to hit the market in the near future. Finally, the Recreation Department has announced that it’s making professional tennis instruction available to New Canaan residents this spring, with all levels of play offered at the New Canaan High School courts and, as soon as they’re open in May, Mead Park courts. The instruction will be led by Dan Scheuler, a Missouri native who earned a bachelor’s degree in business from Drury University, then graduated from the Van Der Meer Tennis University and has worked two summers as head pro at Middlesex Club in Darien, and by Shane O’Reilly, who grew up in Darien and earned a bachelor’s degree in history from Tulane University and has run New Canaan’s fall instruction program for seven years.